In Pakistan, where Osama bin Laden was killed by U.S. Navy Seals, 13% of Muslims hold a favorable view of al Qaeda, 55% an unfavorable view, and roughly three-in-ten (31%) offer no opinion. Support for the organization is in the single digits among Turkish and Lebanese Muslims. In Jordan, just 15% express a positive opinion, essentially unchanged from last year, but down significantly from 34% in 2010. Al Qaeda receives its highest ratings in Egypt, where 21% hold a favorable and 71% an unfavorable opinion. 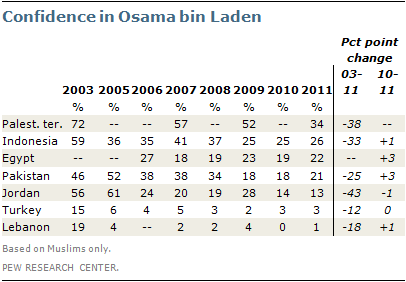 Before his death, support for bin Laden had waned considerably among Muslims around the world. Perhaps the most striking decline occurred in Jordan, where in 2005 61% had expressed confidence in bin Laden to do the right thing in world affairs. The next year, this number plummeted to 24% following al Qaeda suicide attacks in the nation’s capital, Amman. By 2011, only 13% expressed confidence in him. Support for bin Laden also declined steeply over time among Muslims in Indonesia and Pakistan, as well as the Palestinian territories. Palestinians, however, remained more supportive than other publics – in 2011, 34% still expressed confidence in the al Qaeda leader.